Pretty much everything you need to know about Wasteland Weekend can be found here on our website. Including FAQs, maps, style guides, entertainment announcements, etc. 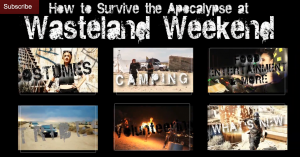 How To Survive The Apocalypse At Wasteland Weekend. A multipart series of short videos from Ren Robot Productions. You can click on the icons at the end of each video to take you to the next one, or just use the direct links below. Please share them far and wide, so that all attendees will know how to prep for The Weekend At The End Of The World ™. Our one minute Mad Max-centric highlight reel. And ALL of these videos and more can be found on our “Spread The Word” page HERE.